Hello I am Beth Swift and I am the Archivist for the College. While keeping the history of a place as rich in traditions and heritage as Wabash I see lots of great images. In this blog, Dear Old Wabash, I will share a bit of the richness of the Wabash story as I post some of the more interesting images, along with a bit of historical context. This first image is a nod to our founders and the early days of the College. This is Center Church which was founded by the same men who founded our College. Just in the back of this image we can see a house peeking out from the church. It was to this house that Caleb Mills brought his new bride when he came to the “Wabash Country” as a teacher and a preacher. To place this image in its proper spot, I should note that this is the corner in downtown Crawfordsville known to later generations of Wabash men as the site of Tommy’s Silver Dollar…Below is a description of the church, and its many connections to the College, by President Tuttle. 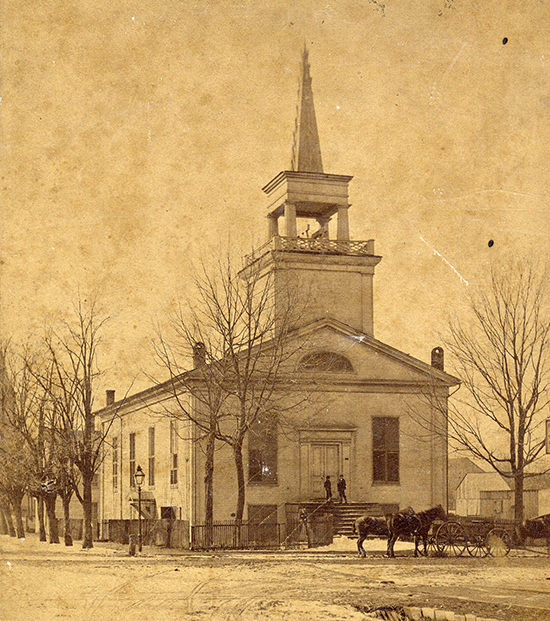 “Old Center Church occupied the corner of Washington and Pike streets. Its successor is ‘The Joel Block’ The old church was not stately or elegant…It had a basement and in front a wide and high stairway, leading to the main audience room….A score and a half of generations of students have used these steps to attend the President’s Lecture…It was also occupied occasionally for lectures and college exhibitions. And among these were the services of ‘Baccalaureate Sunday’ and ‘Commencement Week.’” President Joseph F. Tuttle in the Wabash Magazine of January 1895. 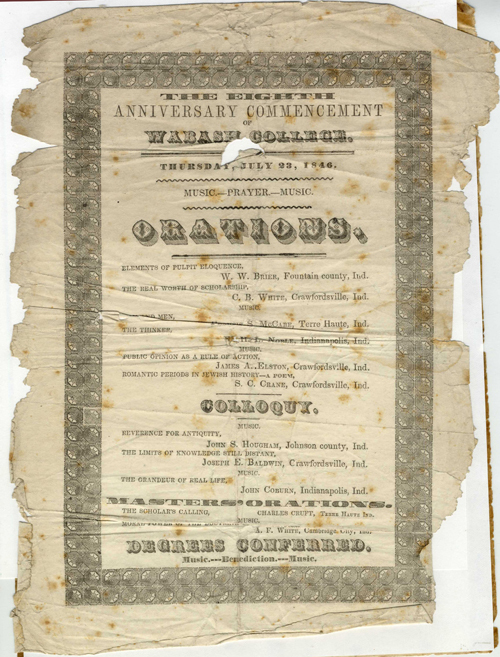 Below is a program from the eighth commencement held in 1846.